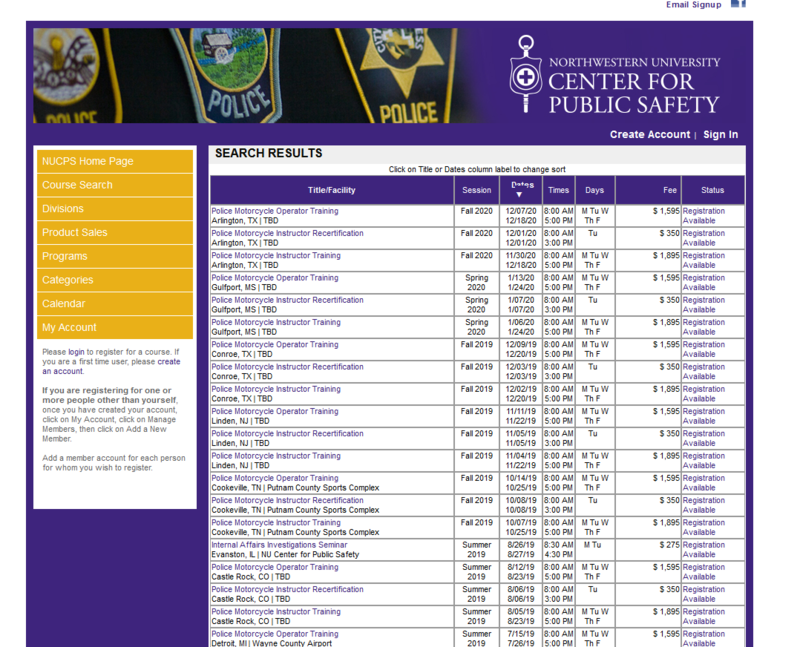 Northwestern University Center for Public Safety offers easy online registration for all of our course offerings. We invite you to take a look around, create an account, and register for a course. Our online course catalog and registration system (registration.nucps.northwestern.edu) allows you to search for a NUCPS course by keyword, topic, division, or location. Click here to quickly view all upcoming NUCPS courses. Click on the "Dates" column header to sort courses in date order. 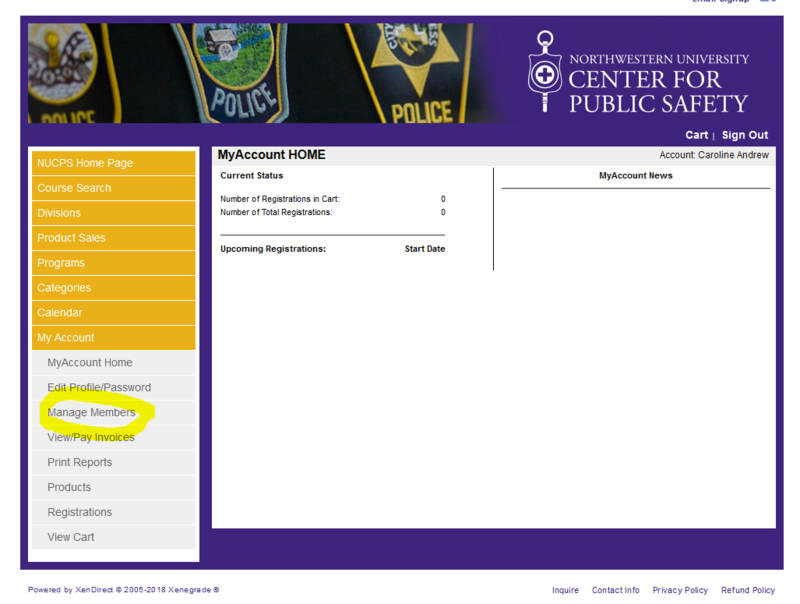 Our registration system is accessed at registration.nucps.northwestern.edu. If you are a first-time student, you will need to create an account in order to add courses to your cart or to register for a course. Your account securely saves your course history and billing information to the system. 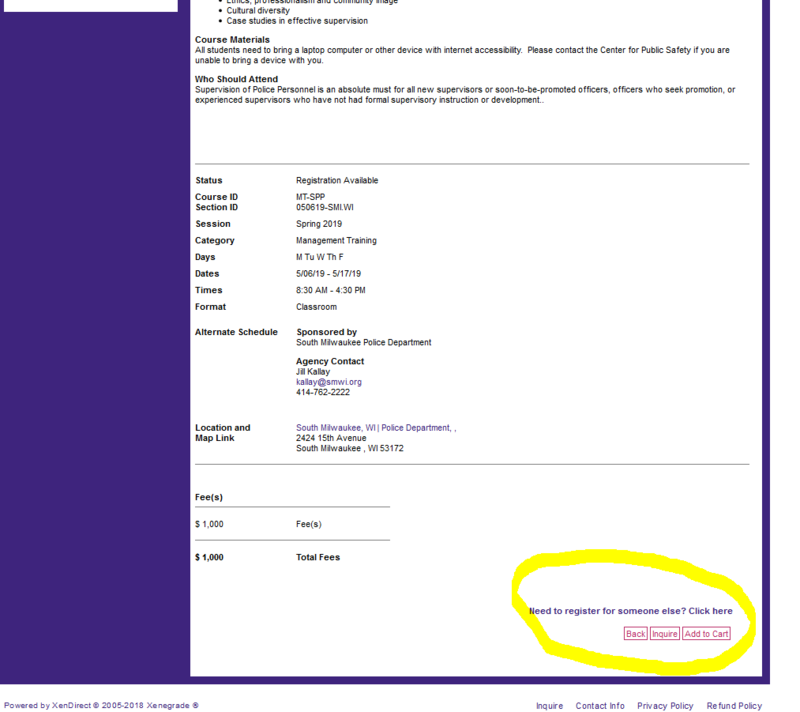 When you locate the course for which you want to register, add it to your cart using the button link at the bottom-right corner of the course description page. Follow the on-screen instructions to complete the online registration process. Agencies can add members to their accounts, allowing a single contact to register multiple students at a time. Once you’ve created your account and are logged in, click on MyAccount from the left navigation. Then click on Manage Members. Now you can add to your account all the members for whom you wish to register. Please be sure to add individual email accounts, birth dates, and addresses for all students for whom you are registering. We never share or sell our student information, but we do need information for transmitting such communications as course information, event invitations, and our journal The Key to individual students. NUCPS continues to offer registration via mail and fax. Each registration is processed upon receipt, and a confirmation letter and invoice are sent to the email address on file. Payment is expected at the time of registration or upon receipt of the invoice and before the first day of class. For online courses, course login information will not be provided -- and course materials will not be mailed -- until payment has been received in full or a purchase order has been submitted. NUCPS accepts American Express, Discover, MasterCard and VISA. From the left-hand navigation, click on MY ACCOUNT. Select the appropriate invoice number from the INVOICE TO PAY drop down and click PAY NOW. Provide your payment information and click CONTINUE. Confirmation of an online payment with a credit card is automatically sent to the email address on file for the account. Credit card payments may also be made during regular business hours (9 a.m.-5 p.m. Central, Monday - Friday) by phone (800-323-4011) or in person at the NUCPS office. Please note: We are accept checks drawn on a US bank and payable in US funds. Purchase orders can be faxed to 847-491-5270, emailed as an attachment to nucpsreg@northwestern.edu, or mailed to NUCPS (see above address). Cash payments are accepted at the NUCPS office during regular business hours (see above). If you are an agency or student outside of the US and wish to pay by wire transfer, please contact Accounts Receivable at 800-323-4011 for more information. Cancellations submitted within 30 calendar days prior to the course start date are subject to a cancellation fee of 20% of the course fee up to a maximum of $400. Students who register for a course and fail to attend without providing notice of cancellation to NUCPS are subject to a no-show fee of 50% of the course fee up to a maximum of $1000. Students who wish to cancel or withdrawal from a course must submit the request in writing using the NUCPS course cancellation form. The completed form may be submitted in one of the following three methods. Please note: Cancellations are not accepted by phone. Students who wish to cancel their enrollment in a course have the option of a refund of the eligible tuition paid or to keep the eligible amount paid as a credit towards the tuition of another class. If a credit is selected, NUCPS will hold that credit for a period of 12 months. After 12 months, the credit must be used or the money will be refunded. If NUCPS cancels a class, students receive a full refund of the tuition paid or have the option of keeping the dollar amount paid as a credit. If a credit is selected, NUCPS will hold that credit for a period of 12 months. After 12 months, the credit must be used or the money will be refunded. Please do not book non-refundable travel more than 30 days prior to the scheduled start of the course. These fees will not be refunded if the course is cancelled at least 30 days prior to its scheduled start date.